At TrainingPeaks we constantly strive to make it easier for coaches and athletes to track, analyze, and plan their workouts; and using the new TrainingPeaks Connect IQ app (available in the Garmin Connect IQ store) it is now easier for you to execute your workouts with a simple push or swipe of a button. 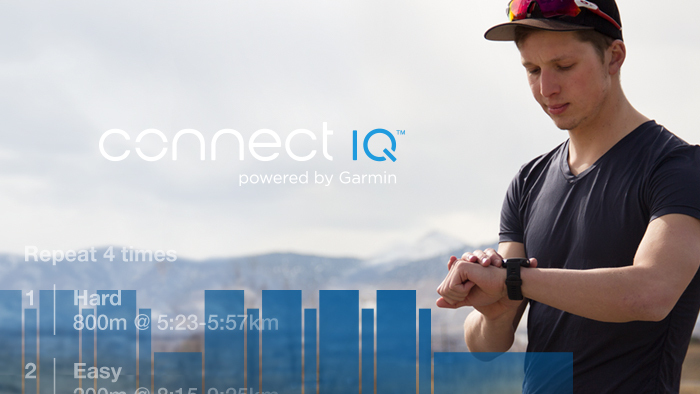 Instead of relying on memory, pen and paper or your mobile device to remember your structured workouts, the Connect IQ app can be loaded onto a compatible Garmin device and taken with you wherever you go. When you’re ready to workout, your device becomes your guide, taking you through every step, pedal or swim stroke. With the new TrainingPeaks Connect IQ app, workouts created with the TrainingPeaks Workout Builder can be instantly loaded onto compatible Garmin devices. The app reads the planned workouts from your TrainingPeaks calendar and downloads a .FIT Workout file directly to your device. From there, the built-in workout mode of the Garmin device guides you through your workout in real time using customized Heart Rate, Power or Pace targets straight from TrainingPeaks. No more incorrect interval intensities, just clear instruction tailored to your individual thresholds and daily workout goals. The completed activity data can automatically sync back to TrainingPeaks for a detailed analysis of your performance, making it easier than ever to track your progress toward your training and racing goals. The app comes preinstalled on the new Garmin Forerunner 935 watch. The app is also available in the Garmin Connect IQ app store and is compatible with all models of the Fenix 5; the Edge 1000, 820, and 520; and the Forerunner 735XT. Start building your workouts with a free 30-day trial of TrainingPeaks Premium or choose a free Kickstart training plan and give the IQ app a test ride.